For many families, the holidays and overspending go hand in hand. As a financial counselor, I see it all the time. Clients seldom think about budgeting BEFORE the holidays arrive. While the idea seems simple; it’s the execution that’s the problem! With some planning and creativity, you can still have a joyous holiday season this year and every year after without busting your budget. 1. Calculate how much you can afford. Ideally, you have saved some money to spend over this year’s holidays. No? Don’t worry - it can still happen. Now is the time to cut back on extras like movies, dining out, gourmet coffees, whatever, until the holidays are over. Without looking too hard, there is always something in a budget you can trim back to save money. If you plan to use money you don’t have (read credit cards), it can take a very long time to repay that debt if you only make minimum payments. Do you really want to still be paying this year’s holiday bills when the 2014 holiday season rolls around? Instead, set a reasonable limit for the amount of credit you plan to use. Then stick to it! At the most, choose an amount you can repay within 3-4 months to avoid high interest charges and overspending. And track those charges as you go so you don’t get carried away! 2. Save and shop early. 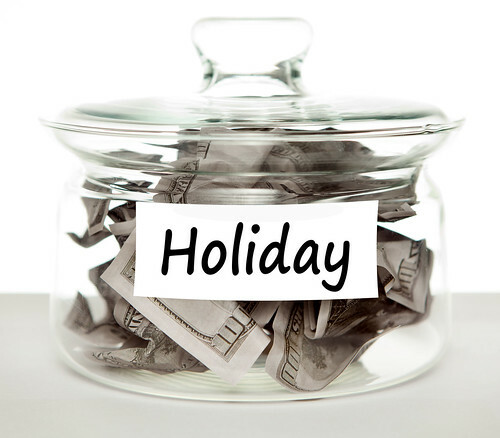 Open a holiday savings account in January 2014 for the upcoming holiday season. By calculating how much you can afford to spend next year, you can divide that number by 12 to set a monthly savings goal. Having cash on hand allows you to buy items on sale throughout the year. This way you’ll get more for the money you do spend. For huge discounts, buy next year’s holiday decorations, cards, and so forth the week after Christmas 2013. Sign up for email alerts for sales with big retailers throughout the year. Another strategy is to buy one gift every paycheck throughout the year. 3. Set reasonable expectations for your family. Talk with your family about keeping gift costs down. You’re likely not the only one who would like to spend less this year. Consider exchanging names or setting reasonable gift limits for friends and family. You could also skip gifts altogether and plan fun activities together! How about visiting a Christmas tree farm to cut down your holiday trees? Or, try hosting a potluck dinner which may lead to a new family holiday tradition. 4. Find a family project over the holidays. Remind your family that the holidays are about giving to others, not just receiving gifts. This is the time to show kindness to others, and experience the joy that giving can really bring. 5. Make gift coupons for your loved ones. Stuff coupons for your children into Christmas stockings. Make them redeemable for time with mom or dad doing a fun activity together, like a trip to the library, playing in the snow, or anything else your kids like to do. This gives each child quality time with parents, and shows how important relationships can be rather than getting more stuff. Coupons for others can be placed in festive greeting cards to show you care and are thinking of them. Coupons can be redeemed for services like babysitting, lawn care or snow shoveling, or cleaning someone’s home. Helping out can mean more to the recipient than a useless gift that does nothing but collect dust. 6. Budget for the extras. We often focus on gift-giving and forget about other holiday costs that can bust our budgets. Such extras include decorations, extra food and drink, greeting cards and postage, travel expenses, holiday donations, and shopping costs like gas and parking. Be sure to allocate some cash for those extras. 7. Keep track of spending. By using cash, you can track your spending and keep it under better control. Every few days, reconcile your shopping list to make sure you don’t spend more than you should. Check in with your spouse regularly to see how much he/she is spending so you both stay on track. Knowing you’re planning your holiday spending based on how much you can really afford will give you some peace of mind at this often hectic time of year! Try to savor your time with family and friends, and show someone kindness every day. It will brighten everyone’s holiday season, especially yours!